We just launched SAP SuccessFactors People Central Hub — a new solution in our portfolio, available today in all regions and industries. Here are the most important facts about it. What business problems does SAP SuccessFactors People Central Hub solve? In a nutshell SAP SuccessFactors People Central Hub is about making integration to HR systems easier and increasing access to people data! This helps our customers to simplify and speed the use of cloud-based HR and people data across their organizations. Let’s first look into the integration aspect. HR data is needed beyond HR — it is essential for many other enterprise systems to run their business processes. User administration, workflows and approval processes, project staffing and cost assignments are just a few examples of where the respective systems for finance, manufacturing, sales, etc. depend on an accurate and up-to-date feed of people data from the originating HR system. Creating integrations between those systems today is a pain point and high cost factor for many businesses, especially considering the maintenance effort when systems get upgraded. The second aspect is about usage of people data. In many companies today this data is locked in outdated legacy core HR applications where only a small group of HR employees have access, even if this data is not confidential. Let’s say that a company wants to give business users access to an org chart to facilitate plans for a reorganisation project or to create transparency about roles and responsibilities. In this case they have to spend money to purchase an extra standalone org charting solution, and integrate this with their core HR system. Or an HR expert has to manually extract the data and upload it to a desktop publishing tool for further processing. In reality this makes the process too error-prone, complex and expensive. Therefore the data remains unavailable to employees. What features does SAP SuccessFactors People Central Hub contain? Many customers these days are moving to SAP S/4HANA, building the digital core for their future business system landscape and utilizing the latest and greatest innovations for Finance and other business modules. With SAP SuccessFactors People Central Hub we give these customers a so-called productized integration for SAP S/4HANA. This means that they receive pre-packaged integration content that is designed, built, and maintained by our experts at SAP, ensuring that both sides communicate smoothly. We also provide productized integrations for other SAP solutions like SAP Fieldglass, SAP Cloud Platform Identity Authentication and many more. In addition SAP SuccessFactors People Central Hub comes with the Integration Center tool and SAP Cloud Platform Integration middleware to build custom integrations, enabling customers to also connect third party downstream business systems with their core HR system in an easy way. 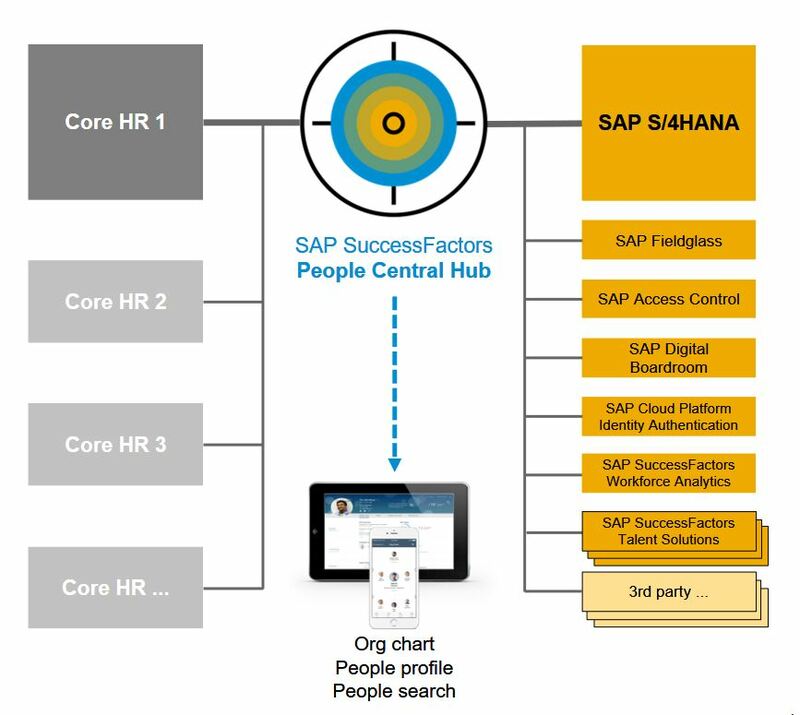 To increase people data usage and transparency SAP SuccessFactors People Central Hub provides access to the following features for all employees (and contingent workers if they use SAP Fieldglass): Org chart, people profile and people search. Better yet, this can be used on a desktop computer via browser or on mobile devices (using our sleek new UI). For many employees this can be a “wow” moment to make digital HR transformation tangible to them. Technically the new solution is based on SAP SuccessFactors Employee Central technology and infrastructure. It therefore contains mature features and can easily be upgraded to a “full-blown” SAP SuccessFactors Employee Central solution in the future. Essentially customers can select a roadmap with two small implementation steps instead of one larger one when migrating their core HR system to SAP SuccessFactors Employee Central. Note that SAP SuccessFactors People Central Hub itself is not a core HR solution — it does not allow entering/changing master data or provide business logic for associated processes like benefits or time management. What customer segments do we target with this offering and what value do they get? For all customers who use a non-SAP core HR solution today SAP SuccessFactors People Central Hub will bring a lot of benefits. It makes integration to SAP S/4HANA and other downstream business systems easier and gives all employees access to real-time people data. It can also be a first step into the cloud and lay the foundation for moving core HR and other HR solutions to SAP SuccessFactors. Customers who run SAP ERP HCM today may already use a productized integration to SAP S/4HANA but can utilize the modern people data services like org chart and people profile on mobile devices. When planning their road map to the next generation of cloud based HR systems SAP SuccessFactors People Central Hub can be a great starting point. Many companies today have multiple core HR systems in a distributed landscape — for example because of acquisitions or independent market units. In this case SAP SuccessFactors People Central Hub can be used as a consolidation hub, ensuring that all people data is collected and integrated with SAP S/4HANA and other downstream business systems. To summarize SAP SuccessFactors People Central Hub lowers cost and risk of integrations, increases access to people data and can be a great asset in a customer’s digital HR transformation strategy. With its attractive price point and short implementation cycle it provides fast time to value, realizes a “people-first” strategy and is a future-proof investment. SAP SuccessFactors People Central Hub is just one of the many great enhancements you will see in this release. Learn about the new features and enhancements for the full SAP SuccessFactors HCM Suite here. Be sure to check out our Q4 2017 Release Highlights document and hear from our new head of product, Amy Wilson, in our Q4 2017 release video.